Laurel was granted a three-year intensive study at the Ramamani Iyengar Memorial Institute (Pune, India). Since commencement in 2007, Laurel has been directly guided by both Dr. Geeta Iyengar and B.K.S. Iyengar (Guruji). 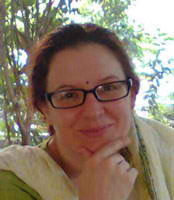 Recently, Laurel received her teaching certificate from Guruji in July of 2009. Teaching since 2000, Laurel completed the Yoga for Scoliosis practicum (’04), and the Southern California Iyengar Yoga Teacher’s Training Program (’05). Also, Laurel has been privileged to assist Elise Miller at the Kripalu Center for Yoga and Health (Lennox, Ma). Laurel has given workshops in the U.S. and Glasgow, Scotland. She holds degrees in Poetry and Philosophy and resides in Pune with her husband. Her mentor, Gloria Goldberg, guides her at the B.K.S. Iyengar Yoga Center of La Mesa. Laurel is available for private and group instruction. September 24-30 San Diego, CA U.S.
** Laurel is an Iyengar Certified Instructor who has done additional training with Elise to become a Yoga for Scoliosis certified instructor. She is highly qualified because of her Iyengar training and has a deep understanding of how to work with scoliosis.